Headed to a new stretch of river in my never ending search for a big perch and finally stumbled on what could just turn out to be a perch goldmine. First cast in a likely looking spot produced a bite and after a powerful fight a slid the net under a big perch which turned the scales to 3lb 9oz, an ounce under my river best. Unfortunately I then found that I had left my camera at home so had to take a image on my mobile phone. No more action for a while and after a couple of moves before dropping a bait in another swim, only to see it nearly ripped of the rest immediately. This bite was missed but placing the bait in the same spot produced another which was a perch weighing 2lb 9oz and yet again another self take was taken. 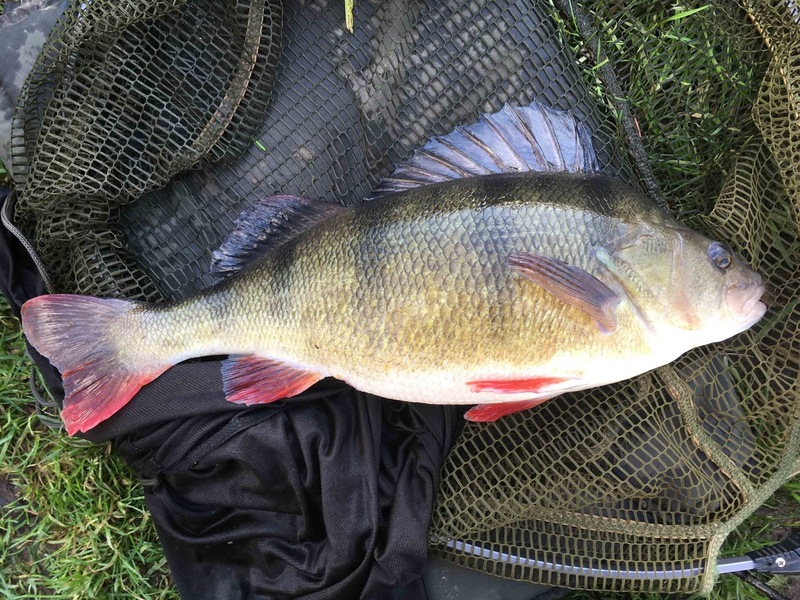 Whilst waiting for the next bite I started to look at the features that my iPhone has and worked out how to take a ten second selfy which was good as soon after place another 2lb 9oz perch in the net. Its early days here and with loads of river to explore further cant wait for my next session. If you are looking for something different this Christmas then why not get your partner to contact me and buy 'A day with Duncan' voucher. You can then book whatever date you want with me throughout the following year and target whatever specie you fancy. As you already know, I fish for every specie so there is a good chance that if you want a big carp, chub, tench, rudd etc, a day simply catching tench all day or feel that you need to learn a new skill such as waggler fishing, grayling fishing using a centrepin and or zig fishing then I'm sure that I can accommodate. If you are interested then in order to get your voucher in time for Christmas then you need to get your partner to get in touch now. I also still have a few signed books left at the silly price of just £10.99 plus P&P. Again email me if you are interested. First winter session of the year and things look good. No annoying small ones, just five bites in a quick after dark session and three modest rudd to show for my efforts. Keep going and you will succeed. The last few days have not been easy especially if its perch that you have been after. 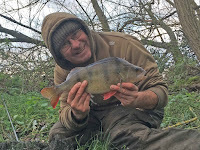 My latest customer John, a regular over the last couple of years had never targeted perch by design so we booked a day and headed to one of my more consistent venues. The weather was once again against us, high pressure, blue cloudless skies and a really brisk cold north west wind. I took a risk and headed to a lake on the complex that I had never fished due to reliable information from fellow angling informative s yet two hours in and just one F1 that took a liking to Johns prawn I felt a bit under pressure. Fortunately the next bite came from our target and weighing 2lb 5oz gave John a respectable personal best. An hour later and with the sun across the swim I made the decision to move onto the main lake, yet after a couple of further swim moves we just could not buy a bite. It was time to scale it down, first to a small piece of prawn on a size 12 then after no bites to a size 18 and double red maggot. Another move bought a swift response from a skimmer followed by a modest roach before John lost a good fish that he was sure was a perch. The light was fading but in true perch form they went on a quick feeding spree in which John managed four perch, all around 2lb along with losing a couple. Would we have caught on the prawn, I don't think so, its just about reading the conditions/situation and making the right decision, something I think we did on the day. In the hope of a much bigger specimen we watched the float through the light of our head torches but it wasn't to be but at least we missed the traffic home. A tough day and from the time we left home to getting back we were out thirteen plus hours, however many would have thrown the towel in far sooner! Here are a few words I received from John.. I've been using Duncan as a guide for just over a year and it's been my best fishing investment ever. With his knowledge, guidance and encouragement during 2017 I've managed to catch 12 pb's topped by a 3lb 12oz crucian. It's been his inspiration that has improved my fishing skills and driven me to explore new fisheries and species that have resulted in my new pb's. Many of these fish I've never previously set out to target but with my new found skills zander, tench, roach, dace, golden orfe were caught whilst not being guided by Duncan. I therefore can only highly recommend him as a guide and angling companion. Booking him for "A Day Out With Duncan" is something you'll not regret. New video to view now! 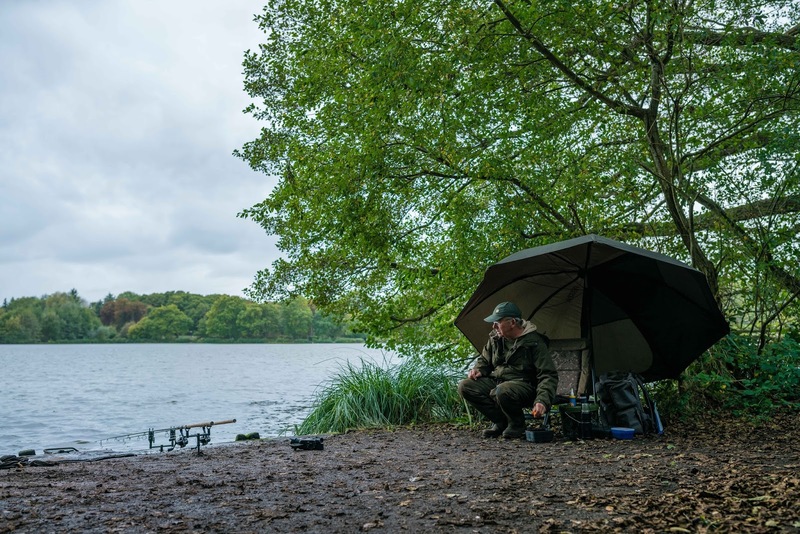 New Nash video at Godalming Johnsons Lake starring me and produced by Carl and Alex now available to view. Lower Itchen Fishery is full of fish. If you fancy being guided on the Itchen, Test or even the Frome then why not email me - duncancharman@me.com for available dates and prices. 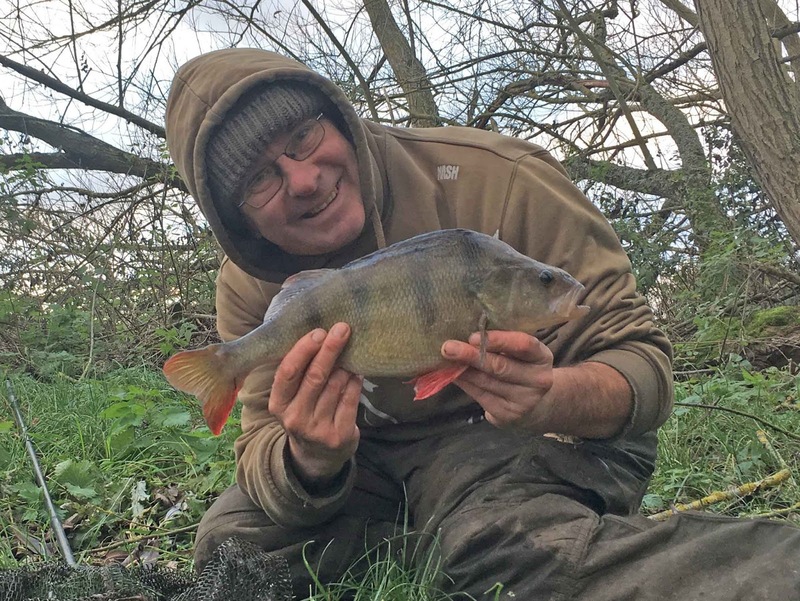 The first frosts have arrived and at last the summer species can be placed on the back burner and winter species such as perch come into the limelight. First session was really a bit of a experimental recce trip and although things looked promising catching from the bank was impossible and the need to get afloat became very apparent when we watched as a couple of anglers bagged not perch but a dozen pike from areas we just couldn't reach. Measures have already been put in place and it wont be long before we too can get to these spots and reap the benefits. Second trip was to a commercial in West Sussex and we couldn't have picked a worse day as the fog didn't lift till around 1pm and it was cold, bitterly cold and then when the fog did lift we were left with a blue cloudless sky and air pressure on 1020mb. 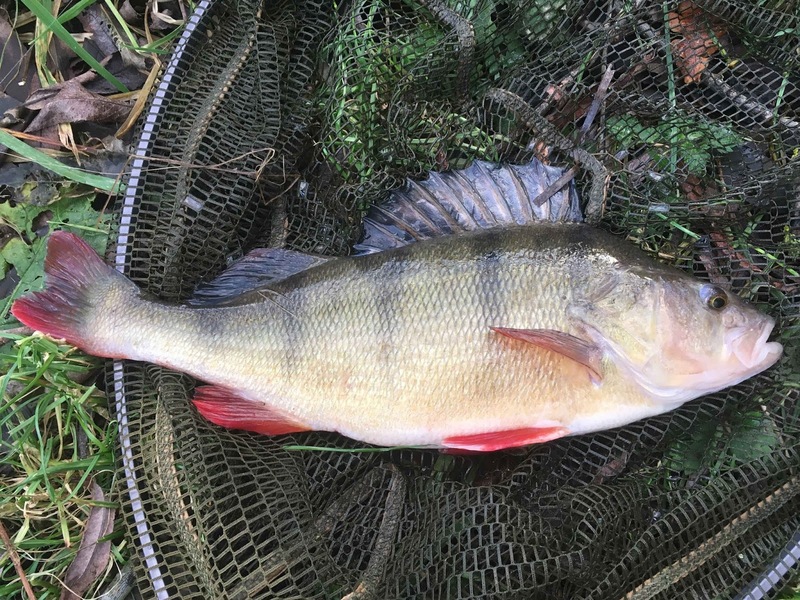 Both Chris and myself fished really hard, trying different methods and moving around and after a hard day we were rewarded with a number of two pound perch. Another really mild month that has seen the transformation from summer to winter species really difficult to make however the last Sunday night of the month saw the first frost which means I can at last forget about summer species and start concentrating on winter targets, perch especially. Godalming Angling’s Johnsons Lake was where I spent most of my spare time, yet the venue was very unpredictable. One day the crucians would be relatively easy as would the carp, the next almost impossible. After a successful day guiding a couple of members, Scott and Will I was confident of catching some crucians for a Nash Video, but try as I did the crucians were just not feeding. I did catch one relatively small crucian straight away then spent the rest of the day catching everything but. The Nash video duo, Carl and Alex were with me and I’m sure will make another Oscar winning production but the day just proved how difficult and unpredictable our sport can be. Also on Johnson saw me hook seven carp in just three hours before having to jump in and save a cygnet. The following day I was back with my dad in the hope he would experience such fine fishing but the wind had turned and the fish gone. Later on in the month and again having one last go for the carp, unsuccessfully, I had to sit and watch a cormorant swallow what almost certainly was a two-pound plus roach. It took around fifteen minutes to swallow it then for the next two hours look uncomfortable as it digested it. If it were my fishery I know what I would do as this is just not sustainable and one day I fear that Johnsons will be an all out carp venue as watching three cormorants work the water on a daily basis is seriously going to make an impact sooner or later. As you will see from my daily posts I love the wild life around me and will do everything to save a suffering bird, but cormorants as far as I’m concerned need to be controlled any which way. Apart from the Johnsons session I have started to travel further afield and enjoyed a brilliant day on the Bridge Pool with my good friend Lewis Deek’s along with travelling once again to the Wye and back in a day and during the first couple of days in November to the Thames and a commercial in West Sussex in hope of a specimen perch. November is going to be almost all about perch with the occasional roach session and maybe a day targeting carp. What with my weekly Anglers Mail ‘where to fish’ column and the continual feature writing for magazines in both this country and abroad its sure to be another action packed month but one I’m looking forward too. Book sales have been manic and with just a small stock left if you want one for Christmas then you need to put your order in now. Just email me duncancharman@me.com and I will let you know how you can get your hands on a signed copy. Another idea that is always popular as a Christmas present is to get your other half to buy a ‘guided day voucher’ from me. Vouchers will be posted out and can be placed in your Christmas card as an added surprise and then be used anytime throughout the year. Again just email me for prices etc. 01/10/17 – A guided day at Johnsons to help member, Scott Poulter and his son Will fine tune some methods to help catch more and bigger crucians. Fishing off the Railway Bank and starting at 6.30am the first fish to fall for Scott was a mirror, known as The Peach and probably the best looking carp in the lake at 29lb 12oz. Not bad on a size 16 hook and 5lb hooklink! 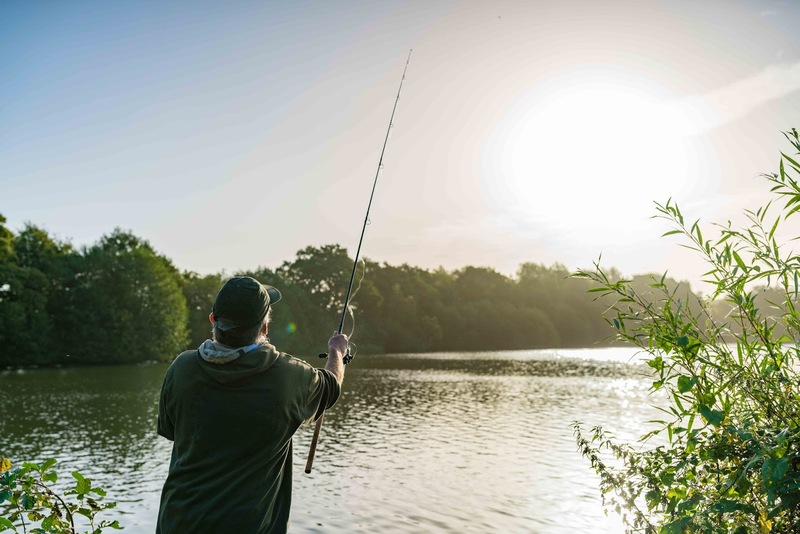 The day progressed in a steady manner with the odd fish falling to both but it was far from easy and regular casting and accuracy played its part in keeping the fish coming. Come dusk, 6.30pm when we called it a day Scott had landed a dozen tench, another carp of around 11lb plus two crucians, the biggest 3lb 5oz. Will who tried his luck for carp at the start then switched to crucians later in the day managed two crucians, the best a personal best of 3lb 11oz! Having fished for the best part of 35 years, I have generally had a clear sense of targets in my fishing but for me it has never been just about catching, or measuring success merely in pounds and ounces, more about a sense of enjoying my surroundings, and working things out for myself so that on the odd occasions that I catch a decent fish I gain that sense of reward that comes with having worked for the prize. 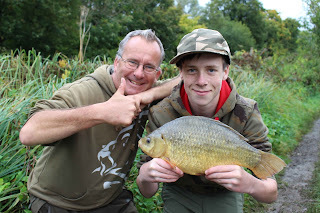 However with my time increasingly at a premium due to family and work commitments I realised that if I was to get the most from fishing then a little help along the way would do me no harm at all and I booked Duncan for a day’s Crucian fishing at the beautiful Johnsons Lake, what a great decision it proved to be. My objective for the day was simply to learn as much as possible so that I could translate those lessons and try to apply them to my own fishing, but I gained so much more than just that. From the outset I found Duncan easy to communicate with, prepared to freely share his knowledge and information built up over years in his own fishing, generous with his time and generous with the use of his own tackle if I wanted or needed it, and he worked hard all day to try and ensure we caught. On the day I also took my son with me, who is showing an increasing interest in the sport, and is beginning to learn and carve out his own direction. Duncan was great with Will and was equally adept and patient communicating with a relative beginner. Whilst the success of the day was never going to be measured by me in what we caught, more by what we learned and we learned absolutely loads, we did nonetheless also bag a few. I managed a pb Mirror of 29lb 12oz on a small critically balanced piece of fake corn fishing with the pellet cone, and also came within an ounce of my Crucian pb with a 3lb 5oz fish. This was backed up with Tench, Rudd, a slightly smaller Crucian and a Common. However it was one of Will’s fish that stole the show, with a stunning 3lb 11oz Crucian, a new family pb and I was very proud of my boy. Duncan took it all in his stride and expressed a degree of slight disappointment that it had been a tough days fishing and was genuinely sorry that we hadn’t enjoyed more success. It is precisely this mind-set and that sentiment that separates the top anglers from the average guys like myself and drives them to keep refining things until they have truly cracked it. The difference being that many of them understandably keep the knowledge won through their hard work to themselves, whereas Duncan is one of the guys who shares it freely. I cannot recommend Duncan highly enough, I will be booking again myself in the future. 04/10/17 – Headed down to Barton Court fishery to produce an Anglers Mail opener. Fished the stick and maggot for plenty of bites from surprisingly dace along with lots of brown trout and minnows! 05/10/17 – In the office all day writing up yesterdays feature and my weekly ‘where to fish’ column. 06/10/17 – A very sad day as we lost one of the families pet, Snoopy from old age. Struggled to get my head around anything serious after having to lay her to rest in the back garden but at least we can talk to her everyday and remember her for all the happiness she bought us all. Hopefully the dace will keep my mind occupied tomorrow on the Bridge Pool. 07/10/17 – A treat from a very good friend and previous customer off mine Lewis Deeks was a trip to the famous Bridge Poll on the river Avon at Christchurch. Arriving at my home at 6am we had the luxury of leaving the van in the driveway and travelling down in the car and after a good journey down we arrived at just after 7.15am. Unfortunately the weather was as comfortable with constant drizzle and a brisk westerly, yet after a few hours this cleared, the wind dropped and the maggots were able to come into play. Lewis was quietly making his rod up but mine was already set and ready to go so after asking for his permission (he did pay) I guessed a depth, placed a piece of corn on a hook and a few yards down the pool saw the float dip and the rod bend double. Lewis just laughed as I tried to get some sort of control on what was obviously a decent sea trout, yet the hook pulled. A few casts later and still with Lewis setting up saw the second sea trout hooked and this one after an immense fight saw what we thought was what’s known as a ‘taker’ in the net, yet two inches oversized (22inches) and weighing around 5lb she was set free to pull another string. That was the end of the sea trout action for me (a few were hooked and lost) and although plenty of quality dace came to hand it was the master that stole the show as it soon became around 10 sea trout to my two! The tide plays a massive part in catching and around lunchtime and with the tide at its highest the bites dried up as did the constant jumping from the trout. We continued to try and get bites but it’s like a switch being hit as just as the flow starts to ebb out to sea the trout and dace start to move again and with this so do the floats. I think we ended up with twenty-six sea trout, Lewis had 16, myself 10 and although I landed three on the trot I just couldn’t match his centerpin line control and expertise at placing them in the net. What a day and an experience I highly recommend. 10/10/17 – On the bank of Johnson Lake come 7am to meet dad and Mick in the hope that the crucians may have switched on. Conditions great with a nice S/W wind blowing into the ‘Chicken Bank’. I had made the mistake of saying I would be arriving at 6.45am so they took advantage of this and duly bagged the best swims at 6.30am, yet an hour later they were on the back foot as it was four nil to me. Three tench and a 3lb 7oz crucian had graced my net so I thought it time to help them out, tie up some new hooklinks and hope this would bring them the odd bite, which it did. Come 1pm when we called it a day I had taken one more tench, another crucian, again 3lb 7oz plus dropping one which looked far bigger at the net along with the standard double figured common. Dad managed two tench, one over 6lb and Mick three crucians to 3lb 5oz and a tench. All in all an enjoyable session but rather cold. Winters just around the corner. 11 & 12/10/17 – Back in the office for a couple of days, this time creating a Catch More feature for AM as well as starting this week’s WFT column. 13/10/17 – Another early morning this time heading to West Sussex to meet my good friend Rikki Cooper who was confident he could put a 20lb plus pike on the bank in a morning session for the camera! Did he do it? Well if you want to know, and the venue he fished then you need to keep buying your copy of Anglers Mail each week! 15/10/17 – Tried to have one last go at the carp off the top but with the lake too busy settled down for a few hours in the less populated areas in the hope of a big crucian. Conditions feel great but white cloud and high atmospherics (1019mb) usually mean it will be tough and it was with just four bites coming from the four hour session. 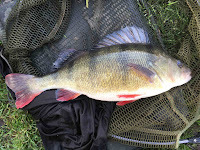 Those fish were three crucians, 1lb 4oz, 3lb 7oz and 3lb 8oz plus a 6lb tench. 16/10/17 – In the office all day writing the pike feature for Rikki and Anglers Mail. chasing her I managed to corner her, jump on top before removing the line and placing her back where she belonged, in the lake. 18/10/17 – After such a fantastic day yesterday I had to take my dad back to experience such great fishing however after arriving at first light it wasn’t long to realise that something was different, the wind. Yesterday it was a nice S/Westerly yet today it had swung 180 degrees and was now coming from the N/East. Although we worked hard and got the odd fish showing it was obvious that they really weren’t having it and come midday, some five hours later we threw the towel in and headed home. How two days can be so different! Back at home it wasn’t long before I was picked up by Thames fanatic Alan Muller, this time heading to one of his favourite swims for barbel at Sunbury Lock. If you want to know how we faired then keep buying your copy of Anglers Mail as all will be revealed. 19/10/17 – In the office all day writing my AM column along with getting the tackle sorted for a day’s guiding on the river Wye tomorrow. 20/10/17 – Arrived at the river rather later than would have wished which probably the reason for not catching as many as we would have liked as all year the river has fished better in the morning. Things looked good, but the water temperature was really cold and I’m guessing it colder as the day progressed as the action tailed off also as the day wore on. Out of the four barbel hooked just one of 7lb 5oz was landed, I even lost one after doing all the hard work, getting it away from the snags only for the feeder to lodge in a snag mid river! Even the chub weren’t feeding with just one showing and come 5.30pm the river looked dead. 23/10/17 – It’s been a bit of a roller coaster couple of days; however a situation that had me seeing the odd sleepless night has now been rectified for the best and I can now once again relax and get my head around things. I was supposed to have been shooting another feature for the Mail Saturday just gone but the weather forecasters had sent out weather warnings about Storm Brian. To be honest I was somewhat disappointed as I had more wind in my underpants than Brian did! Sorry another case of the weather forecasters over exaggerating exactly what was coming in certain regions and making us all batten down the hatches for no reason at all. Thanks! On a positive note my book sales have gone mad and I have been constantly writing messages and signing the latest batch printed before posting them out. Looking at my stock I’m going to have to make another call to my printer tomorrow to get enough in for Christmas. If you want a copy then you need to get in touch now, just email me at – duncancharman.co.uk and I will forward everything you need to know? 24/10/17 – In the office all day catching up with fishing related paperwork. 25/10/17 – Chris my fishing mate wanted to have one last go at the carp on over-depth zigs and although I told him it probably was too late in the year he insisted and in all honesty with a gentle S/W wind and temperatures almost twenty degrees I thought that we might just have a chance Things looked good an hour after arriving at first light with a few carp cruising around and moving under our spodded out slop but an hour later it looked like one got away with the rig, created a big swirl on the surface and that was the last thing we saw of a carp so at 2pm threw the towel in finally for this tactic this year. 27/10/17 – Spent the day in the office writing features. Managed to get two Anglers Mail features completed, my WFT column and a ‘Catch More’ on weir pool barbel. 28/10/17 – Another office day, this time compiling a European roach article and tidying the tackle shed as now it’s turned colder I can finally start thinking about perch, grayling and roach. 29/10/17 – Oh my god, does roach fishing get any better as just returned from Waggoner’s Wells, had the place to myself and using bread punch two rod lengths out caught 32lb of roach to just over a pound in an amazing three hours. I would have caught more but Dad came and sat with me and I asked him to tell me when it was 1pm, however he hadn’t put his watch back and having so much fun didn’t realise until I got back to the car! I think my timing was perfect as today is the last mild day and tonight the temperature is dropping away, we may even get a frost in the morning. We did! 30/10/17 – Typical Monday in the office writing up features. 31/10/17 – The first frost of the winter has seen me sorting out the rods ready for perch which will be one of my main targets this winter and with the next two days to spare I will hopefully get off the mark either on the tidal Thames or down south on Passies in West Sussex.